I’m sure you’ve seen that image of Cleopatra with a serpent crown, big earrings, flawless makeup, a shoulder-length bob, and blunt bangs. That would be historically inaccurate as blunt bangs didn’t come around until a few centuries later. 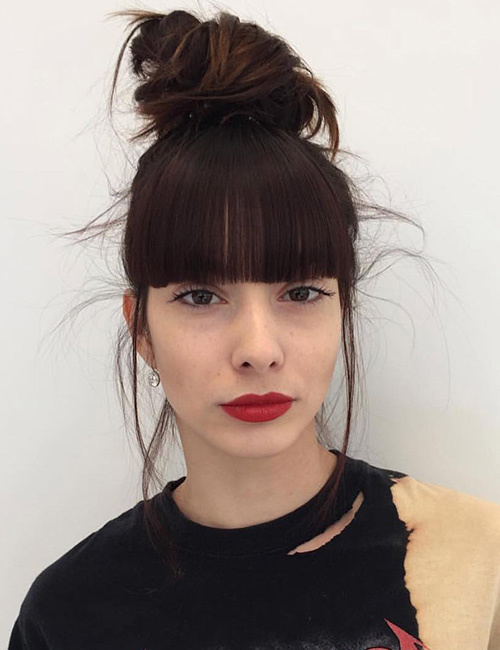 So what do we know about blunt bangs? Allow me to enlighten you. 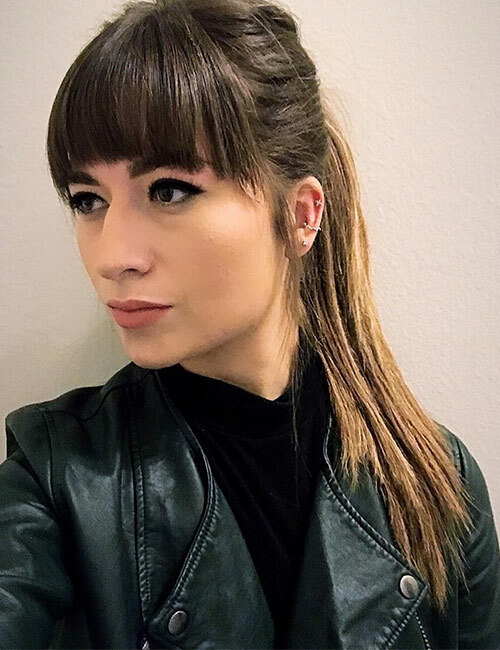 Blunt bangs are bangs that are cut straight across. They are often thick with little to no feathering. Blunt bangs have been around since way before some of us were even born. They really bloomed in the 1920s when women were coming into their own and realizing that they could earn their own money. In fact, they are an essential component of flapper hairstyles. They were out of fashion for a bit, but Zooey Deschanel brought them back. 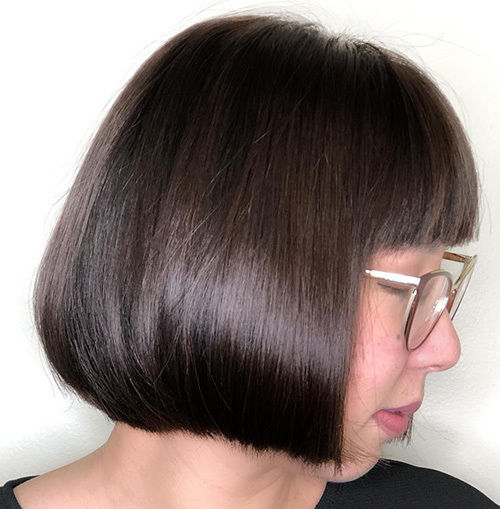 Wanna change your hair look and try out blunt bangs? Here are a few things you need to know before you take the leap. Blunt bangs look great when coupled with any hairstyle. They look especially great with high top knots and low slick ponytails. Blunt bangs are a bit high maintenance. You need to take out time to style them every day. If you are a perfectionist, this means getting the blow dryer and round brush out and sitting in front of the mirror for a good 10 minutes to make sure every strand is in place. 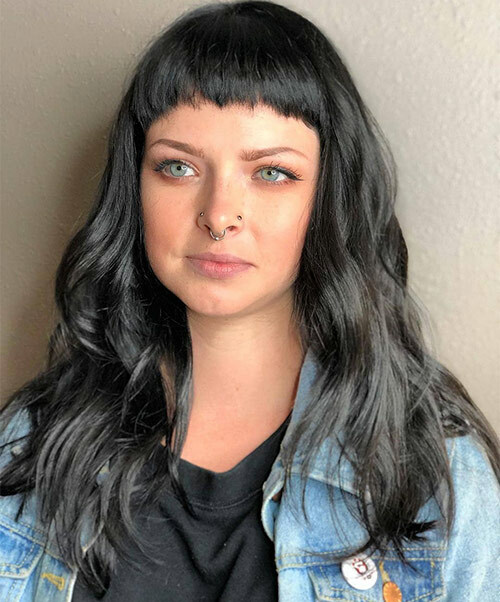 Blunt bangs generally make women look younger. No kidding! Check out this article to see for yourself! Blunt bangs require regular trims. They are usually cut across the eyes or a little above your eyebrows. When they grow longer, not only does it ruin the style, but you also constantly have hair in your eyes. Thick hair means extra hot summers. Having blunt bangs in summer can make your forehead super sweaty. On the bright side, you can pin up the bangs to create a nice pouf. They make your hair look thicker. If your hair gets greasy quickly, it’ll show on your bangs first. If you have a large forehead, blunt bangs are a great way to cover it up and balance your face shape. Now you know what it takes to get blunt bangs and up your game? Great! I know that some of you love to cut your own hair, so here’s one way you can cut your blunt bangs. Section off the hair in the front in a triangle. This triangular section of hair will be cut to create your blunt bangs. Tie up the rest of your hair with an elastic band to keep it out of the way. Comb the triangular section of hair to removes any knots and tangles. Hold the section of hair with your right hand. Twist the section of hair and hold it straight across between the index and middle fingers of your left hand. 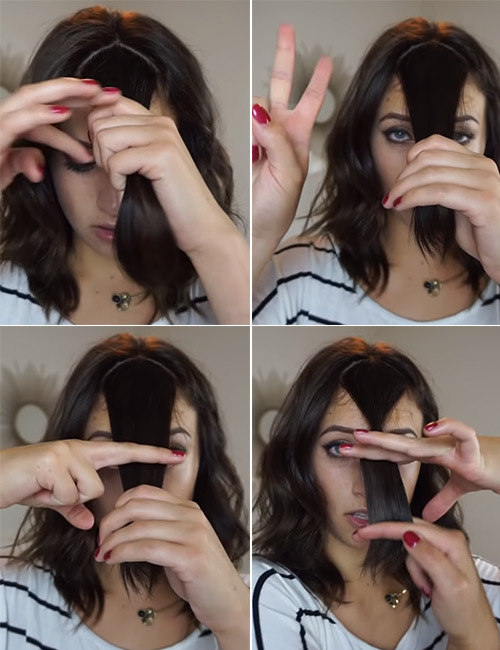 Cut your hair straight across below your fingers. Comb and hold your bangs in a similar fashion as before. This time, keep the scissors pointed up and cut the ends of the bangs. This will add a nice feathered touch to them. 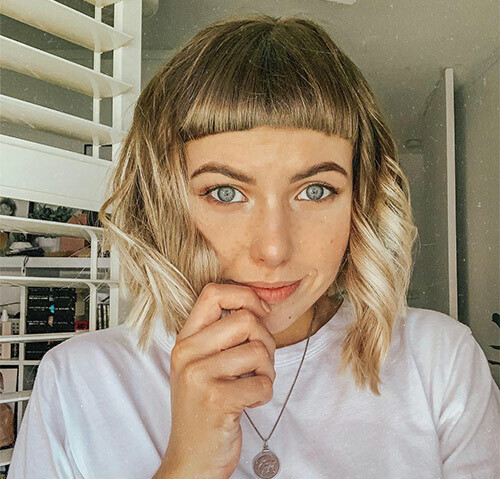 Now that you know how to cut your own blunt bangs, check out these 20 styles to give you the hair inspiration you need! 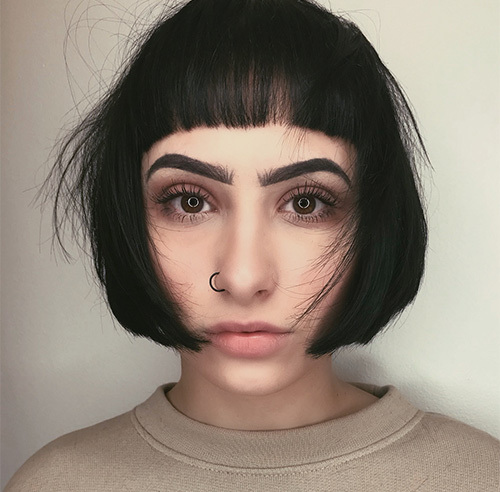 Classic blunt bangs are bangs that are cut across at the eyebrows. When you cut these bangs, stretch your hair out and cut it at the level of your eyes. This way, the bangs move a little higher when they are relaxed. Use a straightener and comb to style them to perfection. Pair these bangs with a high ponytail or top knot, and you’ve got yourself a dazzler! 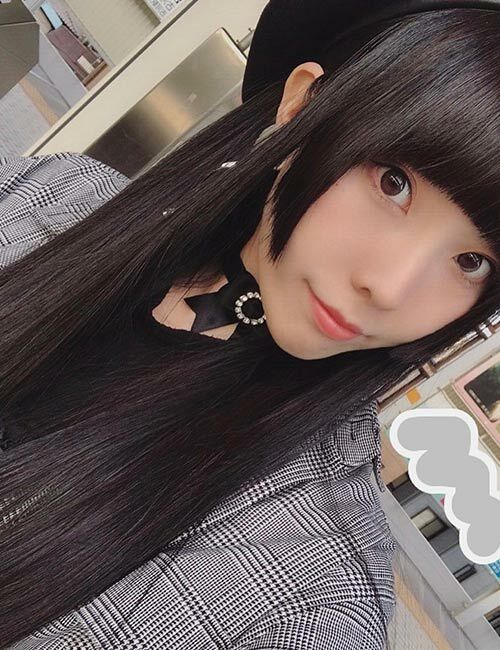 This is one the most popular hairstyles sported by anime characters. It has created a craze that just won’t die down. It is a classic hairstyle with an edgy twist. After you’ve cut your blunt bangs, take a little hair from either side. Holding your scissors diagonally up in front of your face, cut one side of hair. Repeat the same on the other side. Brush your bangs with a round brush and neatly arrange the front with a thin comb. Blunt bangs are usually thick, but that shouldn’t stop women with fine hair from getting them. 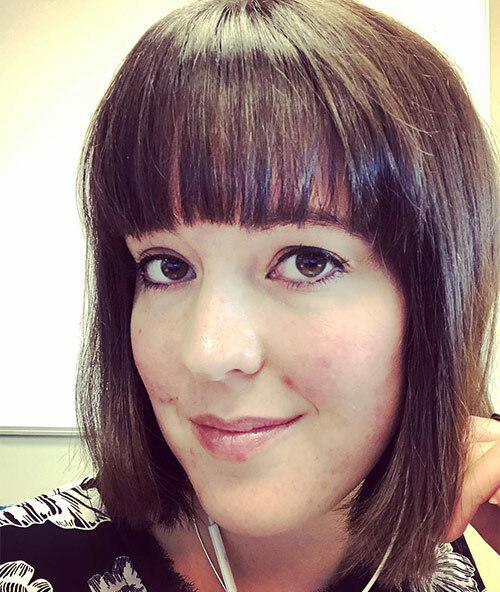 Blunt bangs have many face-framing qualities. Most importantly, they cover a large forehead. Large foreheads can make your face look big. Try this fine blunt fringe. It covers your forehead partially. Another plus point of these bangs is that they bring a horizontal focus to your face. This means that rather than noticing your face shape, people will be focusing on your cheekbones, eyes, and mouth. Simply brush your bangs down to blend them with your hair naturally. Notice how flawlessly curved these bangs are at the eyebrows. That kind of perfection comes from professional experience and months of practice. It’s the sign of a great hairstylist. Also, the disassociated long bangs on either side of the blunt bangs dial this hairstyle up to a hundred. These bangs are ideal for that let’s-get-down-to-business look. Some of us like our hair titled a certain way. For instance, I tend to comb my hair towards the left. When I did some research on this, I found out something interesting. 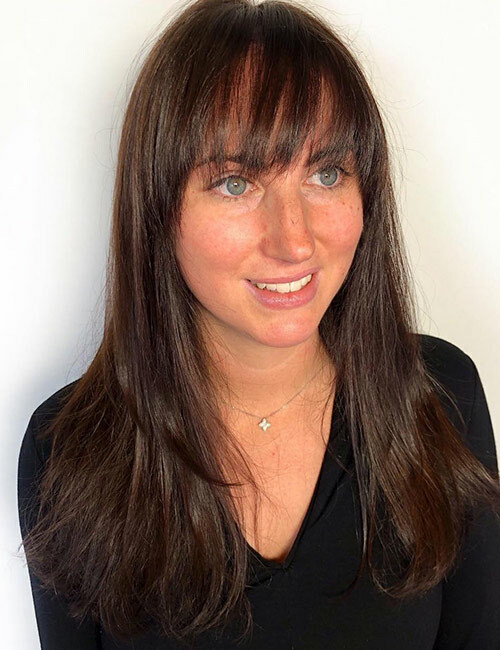 Did you know that brushing your bangs a certain side can balance out asymmetric features? So, if you feel your facial features are slightly unbalanced, try tilted blunt bangs to balance them out. These statement blunt bangs require not only a particular face shape but also oodles of attitude. These bangs cover a large forehead without completely concealing it. They look brilliant on oval faces. 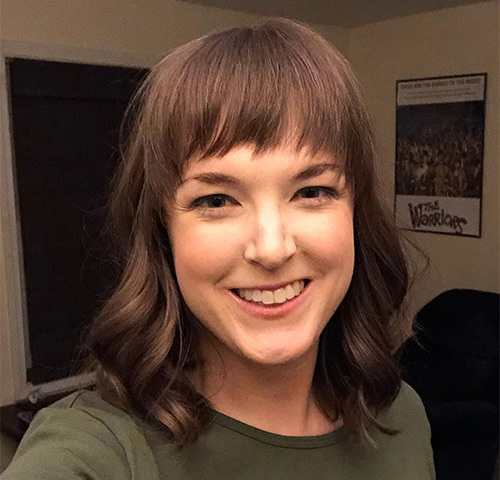 Ask your hairstylist cut the bangs a little longer and then keep trimming them until you’re satisfied with the length. 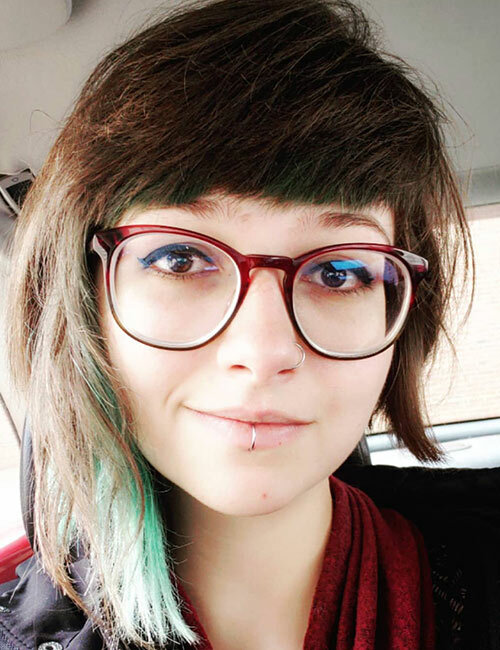 The hair on the sides, right where the bangs end, are shaved off. This accentuates the bangs more. If you have a long face, you can pull this look off really well. But, even if you don’t, don’t cross this one out just yet. Your personality is all you need to pull off these bangs. Talk to your hairstylist and see if there’s a version of these bangs that will suit your face shape. Thick hair is meant to be flaunted, and there’s no better way to flaunt it than with bangs. Hear me out! If you have thick hair, blunt bangs not only look incredible but also make your hair look even thicker than it is. Don’t these bangs look so lush? I love its brunette dimension color blend. Stunning! If you have a small but wide forehead, thick blunt bangs might not be a good option. Opt for these slightly feathered bangs instead. They are thick at the top and gradually feather out towards the end. They draw all the attention to your eyes and cheekbones. 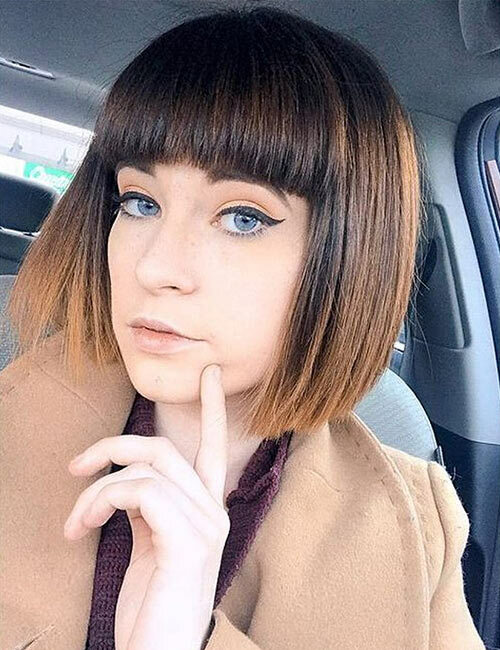 These bangs go really well with bobs and layered haircuts. 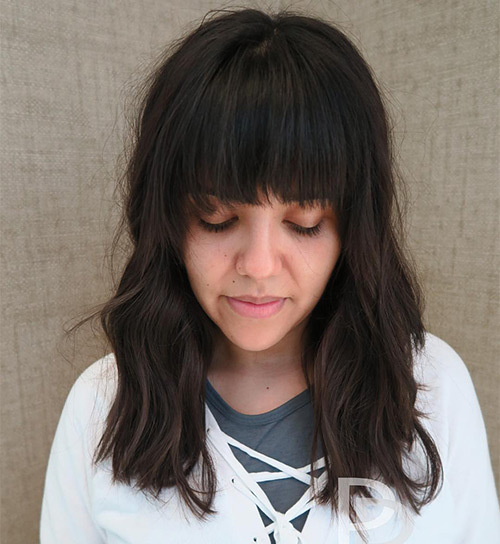 If a simple U-cut is your jam, and you’re looking for something to change it up a bit, try this simple blunt fringe. It can transform a regular V- or U-cut with no layers. Go for thicker ends instead of choppy bangs. It can really spruce up a simple haircut. 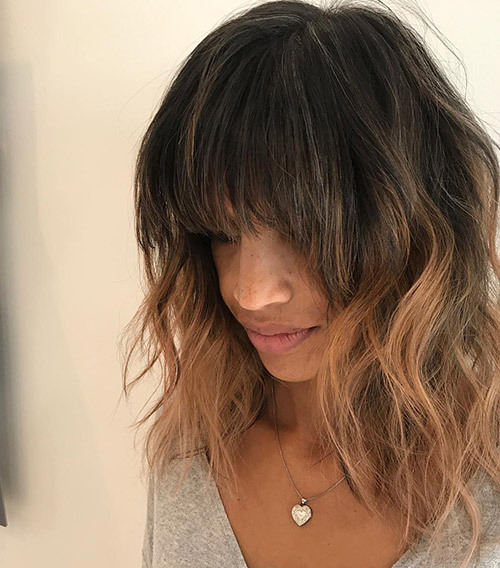 If you’re on the hunt for an edgy hair look, go for these bangs. 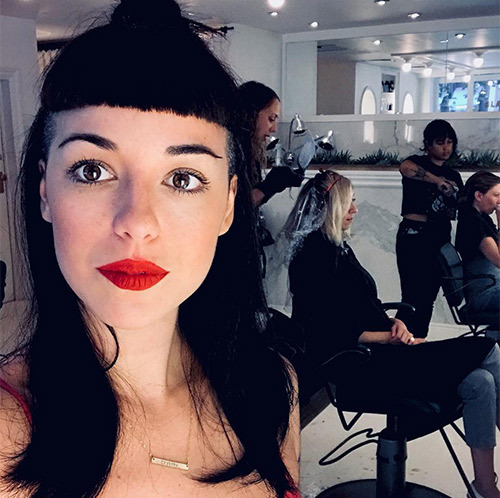 U-cut blunt bangs draw attention to your jawline. 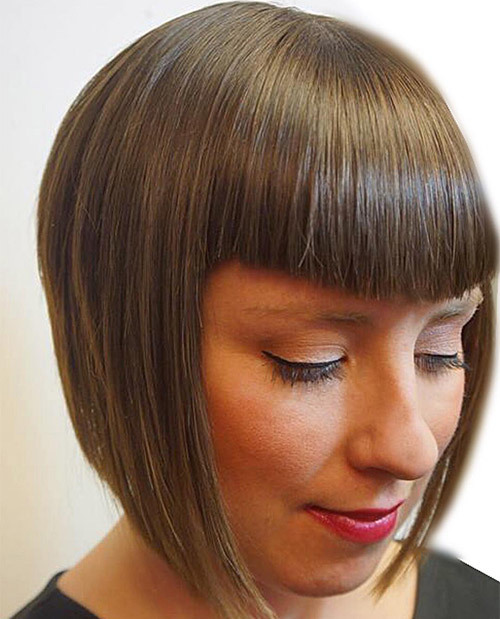 This is one of the most sought-after styles of bangs, and it is most often paired with a gradual bob. This is a great way to flaunt those perfectly shaped eyebrows too! 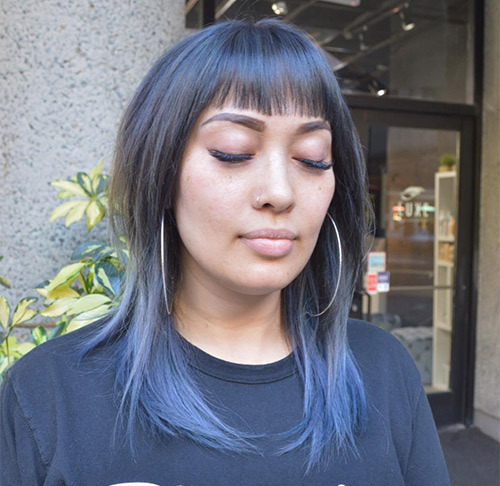 Slighted parted blunt bangs also help balance out the asymmetrical features on your face. They also add a quirky touch to an otherwise simple hairstyle. Try them out to nail that girl-next-door look! Blunt and choppy bangs seem to be all the rage right now! 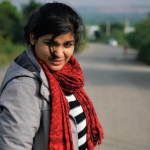 They are the perfect style for completing the grunge look. 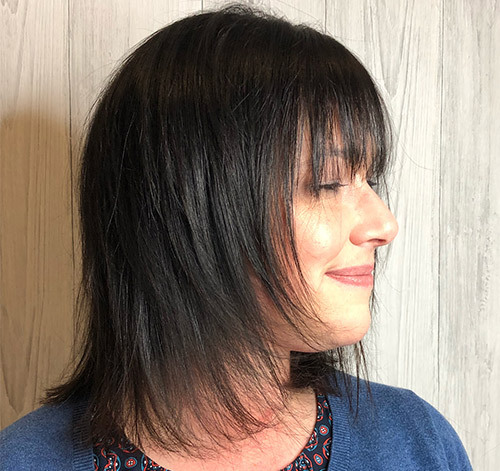 Throw on a leather jacket, apply some smokey eye makeup, put on a deep lip color, and get a layered haircut with these choppy blunt bangs. You are the IT grunge girl now! Not everyone can pull off baby bangs because they tend to exaggerate your face shape. If you have a long face, an oval face, a diamond face, or a square face, these bangs will suit you. But, if you have a wide face or a sharp jawline, it’s better not to opt for this style. 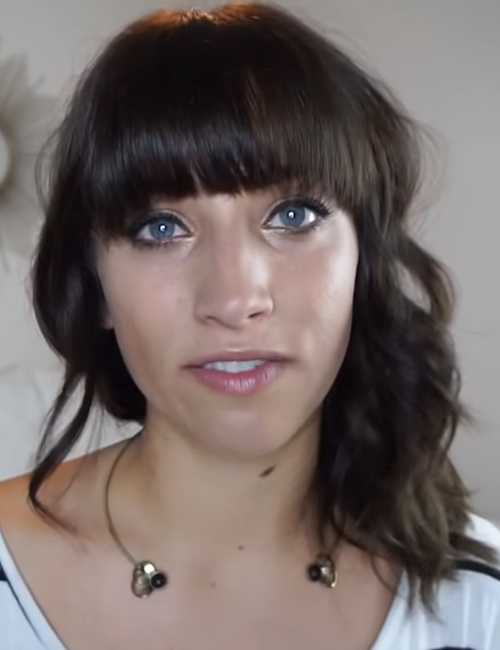 This style of bangs will require you to divide your hair into three sections. One is the center triangular section that will be cut into blunt bangs. The other two sections are the side sections that will be cut in layers to form the longer ends. Feather the bangs at the end using the point-cut method. Style the bangs with a blow dryer and a round brush. These bangs are the best for fall. Cut your hair in the eye-grazing blunt bangs and color your hair in earthy colors, like yellow, orange, red, or ash. These bangs will also accentuate your eye color. I’ll let you in on a secret: a great way to make your hair look thicker is to feather the ends. By feathering only the ends, you make the rest of your hair look fuller than it really is. 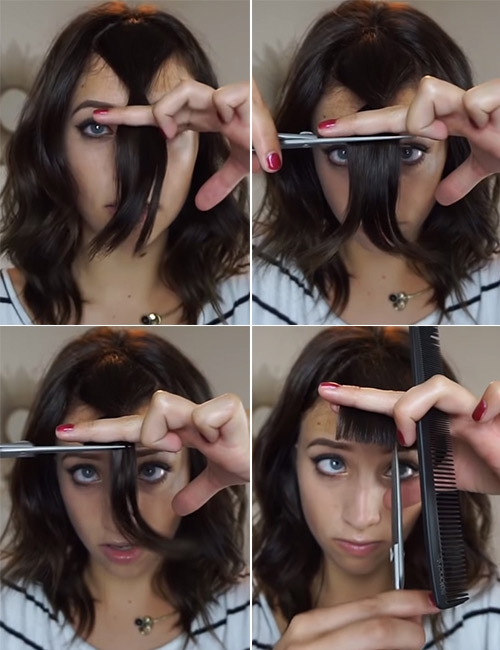 You can feather your bangs by holding the scissors upwards while cutting your hair. Baby blunt bangs paired with chin-length hair is a total ten in my book. Cut your sandy blonde locks in the front halfway down your forehead. You don’t want to cover your forehead completely. 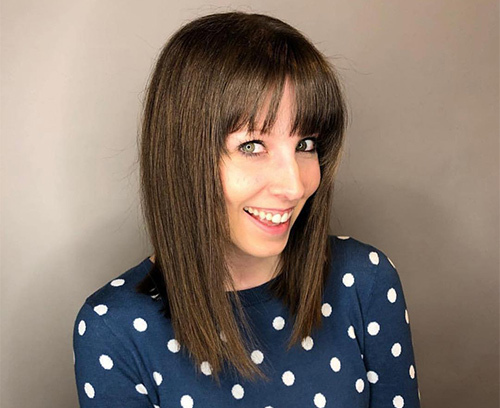 Baby bangs give the appearance of a longer forehead and a more slender face. These start off thin but get thicker towards the end. They merge beautifully into her blunt bob. Instead of going for highlights, color your hair jet black. This will create the perfect nerdy-chic look. These slanted blunt bangs are what all the new emo girls are opting for. The thick layers of blunt hair have been brushed aside and styled with choppy layers to create this emo look. Pair this look with some dark eyeliner and eyeshadow, and you are good to go! Those were my top 20 picks for blunt bangs hairstyles. Which style would you like try? 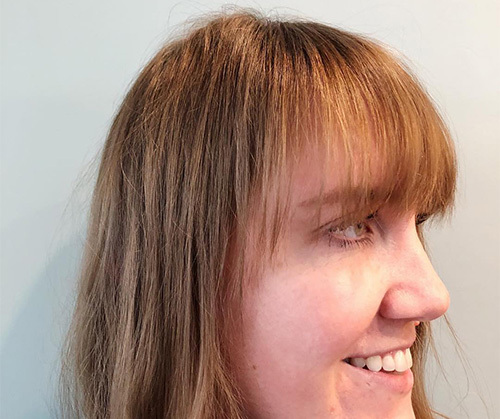 Do you find cutting your own bangs easy? Let me know all that and more in the comments section below.